I’m always looking for new, interesting jazz guitar chords, as well as different ways of looking at all things musical in my practice room to apply to the bandstand. For example, my book, New Approach to Scales for Guitarists: A Modern Practical Method, is a good example of this inherent modus operandi in action. Over the years of shedding and gigging, I’ve stumbled upon some very interesting approaches for the Maj7(b5) chord that you can use in your playing, and that I want to share with you in this three-part series of articles. If you want to move toward a more modern, contemporary sound with your jazz guitar chords, such as Kurt Rosenwinkel and Adam Rogers, then you’ve come to the right place. Essentially, this first installment will be a lesson in chord superimposition and chord substitution. By moving different Maj7(b5) chord shapes around the neck, and superimposing them in place of the chord that is written on the chart or the chord voicing that you might normally play, you will discover new and exciting jazz guitar chords that you can bring into your playing. If the topic of chord substitution has always been a heady topic for you not to worry, I will outline the “tricks” to each example so that, with a little work in the practice room, you will walk away from this lesson being able to apply these techniques on the fly. One of the easiest places to start with Maj7(b5) chords is to simply swap-out a regular Maj7 chord with a Maj7(b5) chord, as you can see in the example below. Trick: Substitute a Ma7(b5) chord with the same root as a Ma7 chord. This generally will work when comping in the jazz style, but be careful when using Maj7(b5) chords in this manner so that you aren’t clashing with the melody or the soloist you are comping for. When in doubt, check the melody for possible clashes. If you can swap-out a m7 chord with its relative Maj7 chord (Ebmaj7 for Cm7 as an example), then you should be able to swap-out a Maj7(b5) chord for a m7 chord. Example 2 shows how to apply an EbMaj7(b5) when you have a written Cm7 chord in the chart. You now end up with a resulting cool sounding Cm6/9 chord as you can see in the example below. The “C” in parenthesis demonstrates the implied Root as this is a rootless chord voicing, meaning the root is implied but not played. The bass player is thinking C (Cm7) but by using EbMaj7(b5), you’re creating a very hip, modern and open-sounding voicing for the underlying Cm6/9 chord. Trick: Play a Maj7(b5) off of the b3 (or a minor 3rd up from the Root) in a minor chord to create a m6/9. That leads us to our next item. You might not know this, but a m6 chord is just an inversion of a m7(b5) chord, but it is. As was the case in our last example, there is a minor 3rd relationship between the two voicings that connects these two chords because the notes A and C are a minor 3rd interval apart. Since you used a Maj7(b5) from the b3 to produce a m6/9 sound (very similar to m6), you can therefore substitute a Maj7(b5) chord for a m7(b5) chord resulting in a more colorful m11(b5). To do this, you find the b5 of the m7b5 chord you are on, then play a Maj7(b5) off of that note. Example 3 demonstrates this concept over an Em7b5 chord, where you’ll play a Bbmaj7(b5) in place of an Em7b5 chord. Trick: Play a Maj7(b5) off of the b5 (or up a minor 3rd from the b3rd) of your original m7(b5) chord to produce a m11(b5) sound. You can also substitute a Maj7(b5) for a Dom7 chord to create a 7alt sound in your comping and chord soloing. To do this, find the 3rd of the Dom7 chord that you’re on, then play a Maj7(b5) chord from that note. You can see this in example 4 below where you have A7, then you find the 3rd (C#) and convert that A7 to an A7alt by playing C#maj7(b5). Trick: Play a Maj7(b5) chord off of the 3rd (or up a major 3rd from the Root) of a dom7 chord to create a 7alt sound. As you can see, this is proving to be quite the versatile chord indeed. But wait, there’s more! In Part II we’ll be seeing how to apply these concepts more in-depth to real world situations. 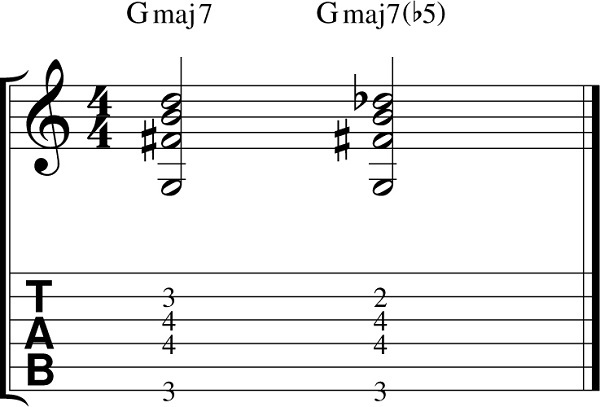 What do you think about these approaches to using different Maj7(b5) chords in your playing? If you would like to hear Adam’s music, visit AdamJazz.com for 4 FREE tracks! Go here if you would like a copy of Adam’s book, New Approach to Scale for Guitarists. Ebook versions available as well. If you would like to post this, or any of Adam’s articles, lessons, or tutorials found on this website, NewApproachToScales.com, on your blog or website, you have permission to do so as long as you do not alter the text or images in any way, and you keep the “About the Author” footer directly above intact with the the proper hyper links.